Few know the world’s largest mangrove forest is in the Bangladesh Sundarbans and provides livelihoods for three to five million people from the southwest coastal belt of Bangladesh. The Sundarbans is also the home to the Bengal tiger, a great source of pride for Bangladesh. As a top predator and flagship species, the tiger plays a significant role to protect Sundarbans biodiversity. The latest tiger status report (2015) estimates there are only 106 tigers in the Sundarbans remaining. The Bangladesh Forest Department conducted a tiger threat assessment indicating tiger and prey poaching and trade as the top factors affecting tiger populations. It has been understood that local forest users, professional poachers and pirates are directly and indirectly involved with tiger and prey poaching in the Sundarbans. 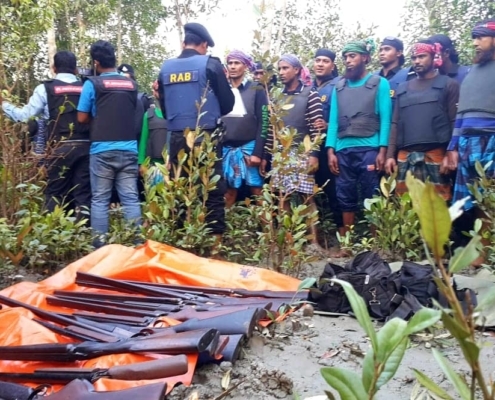 A gang of over 30 jungle pirates were found to be actively involved in tiger killing and illegal fee collection from local forest resource collectors, operating in both Bangladesh and the India Sundarbans. The Bangladesh Forest Department is the steward of wildlife and natural resources of the Sundarbans with camps throughout the mangroves to protect biodiversity. However, this is a dangerous area that is difficult to traverse, has limited survival resources (i.e. no potable water) and communication facilities and the teams have minimal logistical support and security to conduct their work. Despite these challenges there are potential effective ways to tackle the tiger decline. USAID’s Bengal Tiger Conservation Activity (Bagh) implemented by Bangladesh Forest Department, WildTeam, the Smithsonian Institution, Bangladesh Centre for Advanced Studies (BCAS) and Panthera to implement innovative monitoring techniques from 2014-2018. One of the priority interventions identified was to advance patrol monitoring systems in the Sundarbans. A pilot patrol monitoring system following Spatial Monitoring And Reporting Tools (SMART) approaches was tested in a small area the Sundarbans west wildlife sanctuary of Bangladesh. With the SMART approach, data collected by patrollers along with community information (print and electronic media) and GIS portal-based intel were used to identify poaching hotspots and patrol targets throughout the sanctuary. Two mobile patrol teams arrested 242 intruders and deterred many more resource collectors who previously used the west sanctuary. Resource collection in the Sundarbans is regulated by national park laws and is practically difficult to monitor due to the landscape’s tidal nature, the presence of dangerous animals and pirate activities along the Bay of Bengal. Previously, anyone wishing to collect resources was required to pay ransom money to the resident pirates to enter forest areas, indirectly supporting their poaching activities and allowing poaching to persist. 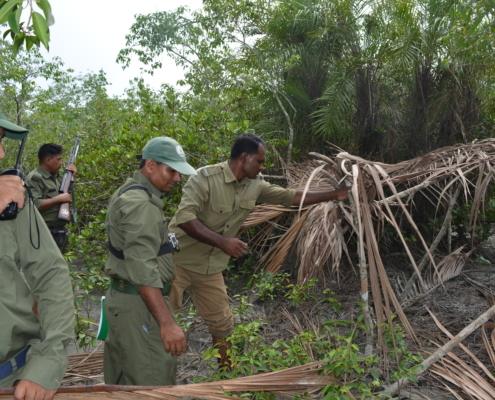 Over the last 23 years, Mr. Keramot, a local villager in the Khulna division of Bangladesh, and many others who have been collecting various forest resources from the west sanctuary have started to avoid these areas when SMART patrols began, shifting their efforts elsewhere. Resource collectors perceived that with the west sanctuary now protected, they needed to identify legal resource collection to sustain their livelihoods. This enabled law enforcement within one and a half years to dramatically change the illegal behavior of resource collectors who, like Keramot, are now looking into obtaining appropriate permits through the Forest Department for Sustainable Resource Collection. As SMART teams patrol the west sanctuary and the entire Satkhira range (one of four Sundarbans administrative units), fewer people are inclined to illegally harvest in the area (and thus provide less financial support to pirates). With SMART team present inside the area, pirates began to revert back to their normal lives and surrender their arms to law enforcement agencies with negotiation support from journalist and law enforcement agencies. Since May 2016, 264 jungle pirates from 26 groups surrendered and the Sundarbans was declared a pirate-free zone. This SMART approach has also had a clear positive correlation to the sustainability of the ecosystem, providing it with relief from resource extraction necessary to regenerate and maintain its biodiversity, including the Bengal tiger. Tiger populations have increased from 106 in 2015 to 121 by 2017 in the Sundarbans. People like Keramot believe it is these changes that will save the tiger and are thus more incentivized to protect the biodiversity of the west sanctuary and Sundarbans. The Forest Department and the Bangladesh government consider the implementation of SMART as one of the best sustainable practices, with benefits for biodiversity. The government has now developed long-term plans to implement SMART patrolling in almost all protected areas of Bangladesh. Integrated SMART approaches using multi-sourced information can be cost-effective for protected area management to tackle illegal wildlife trafficking, as well as for use in wider landscape conservation planning.